#2-406, pair triangle glass sconces on nickel backplate. Has raised clear glass on white background Take one 60 watt candelabra base bulb. 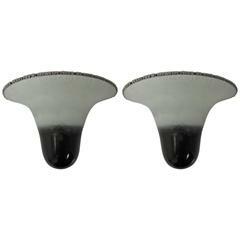 2-1828a pair of tulip glass sconces. Takes 60 watt candelabra bulb. 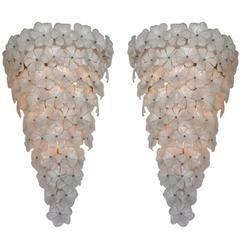 Pair of new opaline glass flower Murano sconce manufactured from vintage molds. Pair of 1960s Mazzega opaline Murano glass ball sconces. Pair of elaborately decorated Italian sconces. Frosted top half with bottom half in amethyst purple. Outer top rim also in amethyst. Signed Barbini and made in Italy. Murano glass sconces with patinated brass stand. 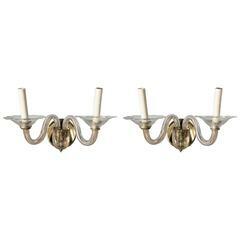 Superb pair of Murano glass sconces, 2 pairs available 2 lights per sconce, 60 watt max bulb US wired and in working condition Measures: Back plate 4.75 diameter. Beautiful and simple Murano glass sconces .